Avion Covers has set the benchmark in outdoor TV cover quality and protection. With our exclusive weatherproof material and superior workmanship our covers are designed to withstand anything Mother Nature can throw at it! From warm tropical climates to chilly northern climates - Avion Covers are designed to keep the moisture our while still allowing your TV to breath. Built in mold resistant properties ensure that your TV is protected inside and out! Avion Covers has incorporated a double stitch technology for the most protection around sealed seams of the cover. More importantly are the seams that allow the cover to be installed and removed, protection in these areas is extremely important. Designed with weatherproof Velcro and a rain guard flap on all Velcro seems to ensure a weather tight seal around your TV, locking it in and securing it form the elements. Fitment is extremely important to the effectiveness of any cover, Avion has tested covers on almost every TV mount and stand style available! Avion Covers are adaptable to almost any TV mount and stand on the market! For added convenience Avion has incorporated a storage pocket for your TV remotes along with cleaning accessories. This pocket fits most remotes along with *BONUS* Microfiber cloth. Avion Covers come with an exclusive limited Lifetime warranty on all covers! 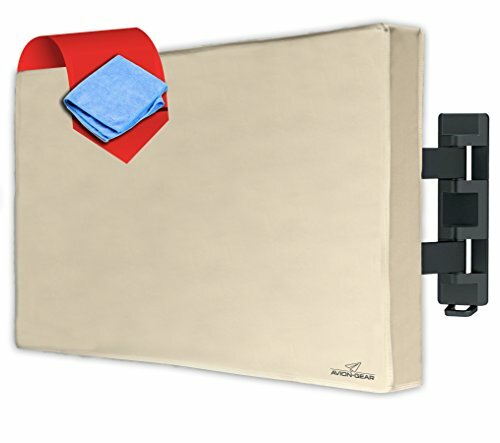 Measurements of the Cover 37" x 24" x 4.5"
Avion Covers are universal and fit almost every wall mount. Double stitching ensures that your TV cover will maintain its shape ensuring good looks with solid protection! Avion Gear offers a LIFETIME warranty on all TV covers! View More In TV Screen Protectors. If you have any questions about this product by Avion Gear, contact us by completing and submitting the form below. If you are looking for a specif part number, please include it with your message.